This is a pretty cute kids’ animation. It opens in a cinema, where a film about aliens is being watched. We soon found ourselves on a planet gleaming with all the 1950s design and music one can handle (oh, and it rains rocks). Only, imagine if… it is humans who are the aliens, landing on another planet. 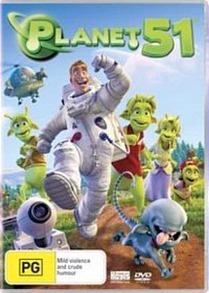 This is the premise of Planet 51, which is obviously a tease about the mysterious Area 51. Sporting a USA flag and NASA outfits, Captain Charles T Baker (voiced by Dwayne “The Rock” Johnson) steps out of his pod and into chaos. Lem (Justin Long) was having a real good day up until he is burdened with the responsibility of taking Baker back to his ship on time. He got a new job, the girl next door (voice by Jessica Biel) was going to go on a date… all swell. The head military honcho General Grawl (Gary Oldman), who looks like you’d expect him (watch out for those broad shoulders! ), has the urge to isolate and remove any possible threats to the status quo. Aided by the hilariously flawed expert Professor Kipple (John Cleese should have had more lines! ), who is after the human’s necessarily superior brain, Grawl deploys militaria aplenty. But Baker, with the help of Lem and a very energetic and lithe explorative vehicle, always seems to get away, facing the inevitable ticking clock. I like the look of this movie, especially the 1:2.35 aspect ratio so reminiscent of Cinemascope movies. I have a weakness for music from the era, so that was a very pleasant surprise. Needless to say, I appreciated the numerous hints to other sci-fi movies (the household pet is a miniaturised Alien creature), like 2001 and ET, and the blurring of the alien/zombie storyline. While there is a lot to like in it, it doesn’t quite have the same studio “sheen” of films like Shrek or Ice Age—which is funny, because Planet 51 characters and Shrek look similar and the two films share the same writer, Joe Stillman. This doesn’t matter to me so much, but fans of über-polished films might be a little disappointed. I also don’t know how well it would connect with children. I imagine successfully: there is much colour, noise and cuteness. The sound is Dolby 5.1 and they didn’t skimp on features, offering three extended scenes; two featurettes; six split-screen comparisons (handy for looking at the animation process; a short film; and a music video. The level of voice talent is pretty impressive, too. The movie is a good time to be had by most people. I certainly enjoyed myself and found myself laughing more than I had expected.